The Internet of Things, big data, predictive analysis, machine learning, artificial intelligence – all phrases you might find on the whiteboard during a word mapping session by any forward-thinking business team in 2017. By now, these buzzwords have matriculated throughout just about every industry, bringing with them the promise of smarter solutions at a fraction of the cost, time, and manpower. But despite the undeniable benefits of these advances, the march of progress can sometimes be a slow one, especially in industries with longstanding precedent like the Oil & Gas industry. Legacy data monitoring systems currently being used in oil production only provide limited downhole visibility, necessitating that operators physically check each well regularly, regardless of individual need. Not only does this waste operator time and company money, but it also facilitates human error/oversight, leaving problem wells untended and expensive equipment potentially damaged. Additionally, significant installation costs aim these products squarely at top tier, high performing wells, and are simply uneconomical to apply to the less prolific, mature wells that comprise over 80% of the market. The oil production industry is overdue for a technological makeover. Management teams want comprehensive, real-time well visibility, they want it cost efficiently, and they want it in the palm of their hand. Enter Ambyint. Ambyint is on a mission to take the legwork out of the day-to-day operations associated with managing low-producing wells. The company began selling its market-leading leading controllers and VFD packages to customers in Canada in 2006 under the name Pumpwell Solutions, and by 2012 was actively acquiring data, monitoring, and optimizing over 1,000 horizontal and vertical wells across Western Canada at an unheard of data sampling frequency of 5 milliseconds. 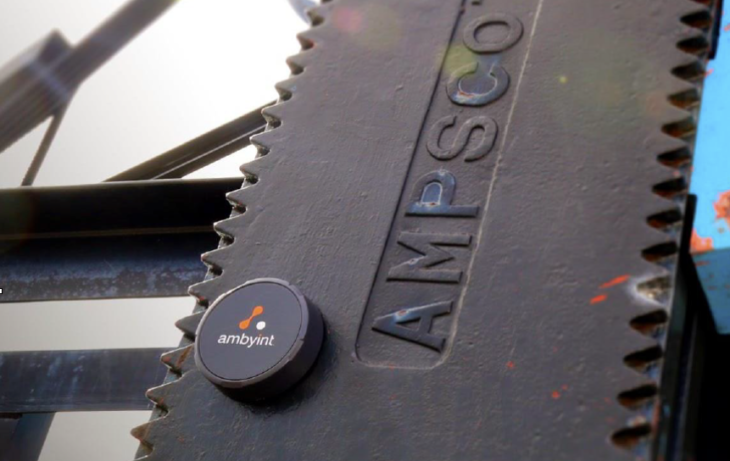 In 2014, the team rebranded, and the freshly minted Ambyint first introduced the immense power of the Industrial Internet of Things (IIoT) to Western Canada’s oil patch. 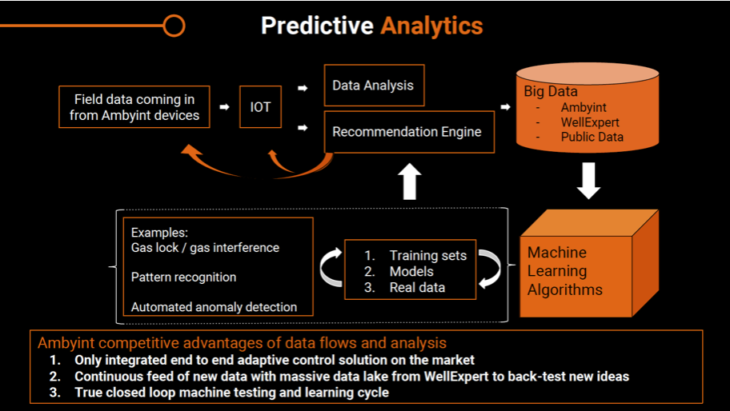 Utilizing the already massive pool of data gathered from its Pumpwell days, Ambyint set about taking optimization technology to an entirely new level. 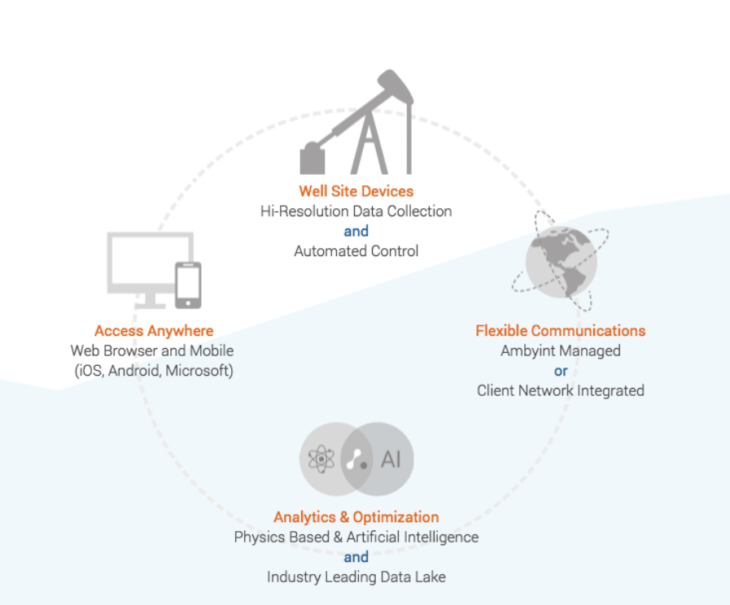 Through combining and leveraging proprietary hardware (IoT or ‘edge’ devices based on embedded systems electronics, you’re your smartphone) with “best-of-breed” software to deliver a data-powered reporting, analytics, and recommendation engine, Ambyint hopes to give every oil well in operation the compelling ability to benefit from intelligent optimization. From its inception, Ambyint has consistently shown its products to be superior to the incumbent product offerings. With 20%+ in operating expense reductions and 10%+ in production improvements to E&Ps, Ambyint’s customers benefit from <6-month paybacks, even on low-value stripper wells. Ambyint’s magic formula is the ability to remotely collect, monitor, and analyze data from every single stroke of a pump to enable a level of intelligent automation that takes the density of human interaction out of the equation. By digitizing the visual input from over 33 million dynamometer cards (or dynocards, for short), Ambyint’s AI-based platform can perform micro-pattern analysis to diagnose downhole and surface anomalies, optimize well parameters, and even predict potential system failures. Since the 1960’s, production engineers have largely relied on a control system called SCADA (Supervisory Control and Data Acquisition) to collect their well data. SCADA gathers information, such as pipeline pressure readings, transfers the information back to a central site using programmable logic controllers and discrete PID controllers to interface with the process plant or connected machinery. The system alerts the home station that an out-of-bounds (based on manually configurated alarms) pressure event has occurred via the operator interface, which enables monitoring and the issuing of process commands such as controller setpoint changes. Then, real-time control logic is performed by networked modules, which connect to the field sensors and actuators. This allows SCADA to carry out necessary analysis and control, such as determining if the leak is critical and then display the information in a logical and organized fashion. However, “logical and organized” doesn’t always equate to ease of use, and it certainly doesn’t mean the data coming in is comprehensive. SCADA has a data sampling rate anywhere upwards of 30-second intervals, meaning that any anomalies that occur in between those 30+ seconds might go unaddressed – and that can spell big trouble for well operators in the long term. Ambyint has provided what they think is the next logical step in the evolution of SCADA. Thanks to connected, pump-mounted sensors and secure wireless networks, essential data from onsite machinery is now collected at a fraction of the cost it once did. Moreover, at 5-millisecond intervals, Ambyint’s High-Resolution Adaptive Controller (HRAC) procures pumpjack data at an order of magnitude increase in sampling data rate over SCADA, meaning more downhole clarity and significantly fewer unnoticed problems. Once data is collected, the HRAC transmits it to a modern, user-friendly platform where it is analyzed and structured into a single configurable interface, meaning fewer clicks and faster cycle time to well optimization for well operators. Google-like full text and parameter driven search also allow for finding problem wells easily without having to scroll through pages of wells. After the analysis of each well, the HRAC automatically and autonomously reads and initiates specific micro-adjustments to each individual pump stroke, thereby maintaining optimal production and efficiency – all without the operator having to lift a finger. CEO, Ambyint Alex Robart is an entrepreneur with a fervent passion for technology and energy. He has launched, built and sold two data/research companies focused on upstream oil and gas, and has proven himself as a savvy investor in numerous early-stage energy and technology startups. 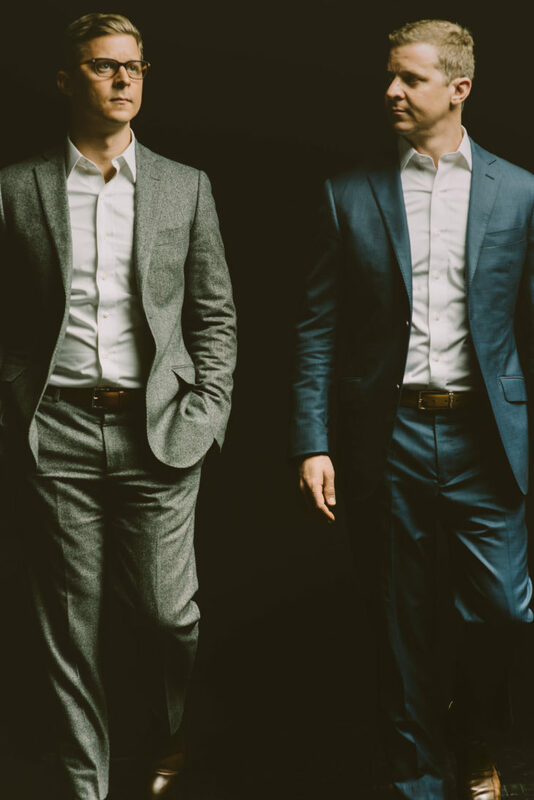 Alex’s past consulting efforts have focused on market analysis and strategy development, as well as investment due diligence for oilfield services, equipment, consumables/materials companies, and investors. As someone with deep expertise in the complex oilfield services value chain and market, as well as the emerging “digital oilfield” landscape, Alex is excited about Ambyint’s future. Ambyint incorporates an exception-based management system to monitor data inputs from the well, so operators only need go on-site visits when a problem is identified. Ambyint’s tech has shown an 87% reduction the need for in well site visits by operators. By monitoring and optimizing based on weather conditions, time of year, electricity pricing, oil pricing, etc., Ambyint improves overall well performance by 10% on average. In a case study, Ambyint increased production revenue across five wells by over $52,000 –that’s almost $10.5k per well. A physics-based analysis is complemented with artificial intelligence on Ambyint’s scalable cloud-based platform, resulting in high-performance output. This ultimately reduces lease operating expenses for operators by 20% on average, a figure that is currently unsurpassed in the market. In a trial with one customer, Ambyint saved $100k in annual operations costs across 40 wells. Ambyint harnesses the full oil potential of a well with a full and complete feedback loop. Because the tech is tied to the Internet of Things, it is constantly refining and improving its knowledge, tracking, and feedback. Predictive modelling takes over, integrating the most current best practices for optimization potential. Ultimately this provides operators with a consistent ever-efficient dataset that keeps their wells at peak performance. In fact, Ambyint provides on average a 19% reduction in strokes per day and a 69% average reduction in callout cycle time. The proprietary Production Optimization Platform (POP) provides for monitoring, operations, management, and optimization. It can integrate with customers’ existing SCADA infrastructure, or deploy in combination with Ambyint’s HRACs, which provide higher resolution data and control/optimization capabilities. Ambyint delivers unparalleled insights with POP but can deliver improved insights and real-time actions at the well site with the end-to-end solution that leverages its HRACs. Typical SCADA total cost of ownership (TCO) is about $35,000 and the Ambyint TCO is $5000. 1/10 of the cost. Allowing scalability, computational modeling, and intelligent systems to interact with well data, Ambyint has elevated its platform using cloud-based Amazon Web Services (AWS). Amazon Web Services allows Ambyint to focus on well optimization while they provide a scaling platform model for expansion and efficiency. 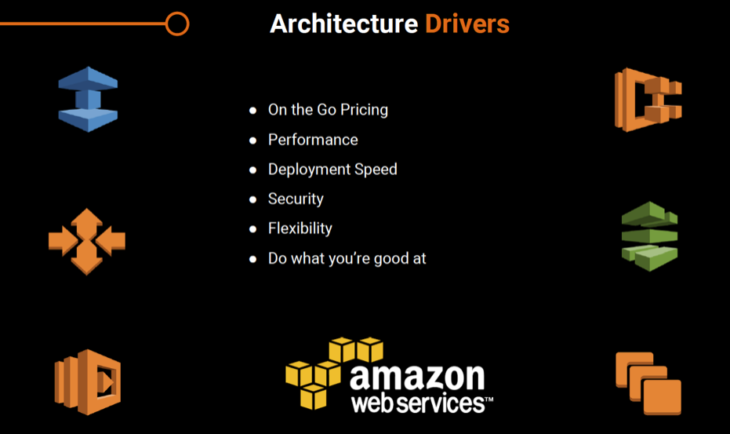 AWS provides the speed, security, flexibility and pay-as-you-go options needed for Ambyint to ultimately save operating costs for their clients. Security is also a factor in drilling data. The Ambyint HRACs, operating under the AWS platform, deliver secure cloud-based operations that are immune to attack and allow for encrypted storage. Operators having to piece together that model of operation on their own would simply not be cost-efficient. The traditional production operating methodology was “visit every well, every day”. Thankfully that era is now over. Pump by Exception operations have advanced to new and exciting heights with digital technology, and it’s happening at exponential rates. So at a time when operators are constantly struggling to improve performance while reducing costs, Ambyint, AWS, and digital advances are extremely good news. And we’ve only just begun….